category : City Report | Luxury insights China © 2016 FDKG Ltd. In a country as large as China with such a huge population, there are hundreds of cities, each with millions of citizens, many of the names of which will be new to you. Our city report section aims to present the status quo and market conditions of some of these cities using quantitative and qualitative data, just reading the numbers may not help you understand the city or the consumers without expert interpretation. With the slowing of expansion among luxury brands, understanding the consumers and their changing expectations now become very important. Therefore understanding the consumer means understanding the city. As the youngest municipality in China, Chongqing shows great potential to catch up with super cities like Shanghai and Beijing. Although its GDP was ranked 6th in China in 2014 after Shanghai, Beijing, Guangzhou, Shenzhen and Tianjin, its growth rate is the highest at 11%. Among all the four directly controlled municipalities (Shanghai, Beijing, Tianjin, Chongqing), Chongqing is the largest, covering 82,373 km2 essentially equating to a province. It also has an equally large population of 29 million, bigger than many countries of the world. 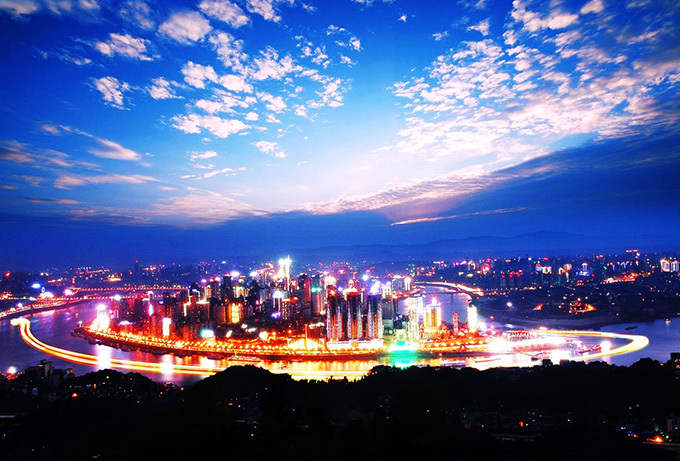 At first sight, the economic achievements of Chongqing do catch the eye. However, once the huge population is taken into account, the average data is not comparable with other municipalities. This problem resembles that of China as a whole: its total economic volume is among the worlds highest, but the per capita index reflects the truth that it’s still a developing country. Nevertheless, given the nature that Chongqing is as big as a province, some of its districts could actually be considered as a “city” elsewhere in China. By narrowing down to administrative division level can help us to better understand those citizens of specific areas who are already as mature as their counterparts in more developed coastal cities and where the business focus should be. Nine core districts sit at the center of Chongqing, 88% of which are urbanized and cover 5473 km2; within them sit the major business circles. In 2007, the local municipal government introduced its “1 hour economic ring” plan, initially to focus on developing the areas that are within one hour’s travel of the outer ring road of the city. The two distinct areas are those in which the citizens of the middle class and upward are expected to live in the coming years. Compared to Chengdu, the neighboring city with a similar culture that is currently the third largest for luxury consumption in China, the region within the 1-hour economic ring in Chongqing actually performs better in terms of GDP and its consumers are catching up with those in Chengdu in terms of knowledge. Those who live in the 9 core districts have also already surpassed their neighbours in terms of per capita retail sales of consumer goods. By using these administrative divisions, we can see that the core districts of Chongqing are where the greater consumption currently takes place, while the 1-hour economic ring generates greater GDP overall. Currently there are three business circles in Chongqing where luxury shopping malls are located: Jiefangbei, Guangyinqiao and Yangjiaping. The developments in the first two are more traditional in design and function, and do not meet with the developing consumer needs in terms of facilities and shopping choices. As the trend of building one-stop shopping destination grows across China, the only mall currently up to this standard is the MixCity located in Yangjiaping. However, given its location, quality of footfall and limited brand presence, there currently is a void between the mall and mainstream luxuryconsumers. Compared with the existing shopping malls, those developments that will open in the coming few years are likely to alter the market. For example, IFS, which is being built by Wharf Holdings claims that the new development will be a perfect replica of their Harbour City mall in Hong Kong. IFS will be at the center of a new business circle and planned sub financial center of Chongqing: Jiangbeizui. Raffles City Chongqing will open in 2018, and is the first high-end shopping mall in mainland city from the developer who has successfully built multiple mid-range malls all over China previously. This new development sits in Chaotianmen, similar in terms of its importance as Central in Hong Kong. The new shopping malls will definitely upgrade the luxury experience of the city and greatly increase the luxury sales space available to premium brands. Even though they may outperform the old developments on paper by nature of their new build and huge size, there will still be fierce competition between them as they fight for brands and of course, consumers. The opening of IFS next year will create a totally new shopping mall landscape and we await the market reaction. In what may be considered a rural location like Chongqing, one may imagine a super-rich local consumer could possibly fit the image that local people describe as Hao on the Chinese internet. The name combines two characters that mean ‘no taste’ and ‘rich’. These people are considered to have quickly gained wealth in developing cities like those inland, have no experience of good service or learning good manners; leading to the impression that they ignorant and less exposed to quality brands and service than their coastal counterparts. However, our 2015 research would indicate otherwise. Chloe is a 30-year-old junior level employee of a privately owned insurance company based in Chongqing. “The reason I know that I spent 300,000 RMB on luxury last year is that other than the money I gave to my parents and my daily outgoings I actually have nothing else to spend such a large amount of money on. I don’t need to pay a loan, I didn’t purchase a car, so where could I spend all the rest of my money? All that is left are luxury bags, clothes and these sorts of things,” said the lady with short hair wearing navy blue smart casual clothing sitting in a local hot pot restaurant with Chanel studs in her ears and a Celine bag on a bench beside her. Let’s not assume that Chloe is a HAO as described on the internet so easily. She actually has quite a lot shopping and dining experiences in high-end locations in cities like Shanghai and Beijing, given that she is a frequent traveller for both business and personal purposes. We should also not ignore that the younger generation of Chinese from inland cities have much more access to information and the means to purchase luxury. They accumulate knowledge via travel and always have contacts abroad given the huge number of Chinese students sent to study and work overseas. Those like Chloe find a price difference as high as 4,000 RMB acceptable when comparing local prices with those overseas, and although purchasing luxury locally is affordable for them, they choose not to buy because of the available product choice unsatisfactory. Their journeys outside of Chongqing make them realize the differences between their own luxury stores and those in other cities, and has educated them that service is also an important part of the money they pay for luxury products. To reinforce these facts consumer, we quote Chloe’s friends who joined the hot pot meal a little later. The well-dressed ladies and casually dressed gentlemen are also experienced luxury consumers and frequent travelers: “For important occasions or treats for visiting friends, we do find there is a gap in the luxury market that needs to be filled. But for ourselves, the nightlife in hot pot or barbeque restaurants are also our life and our culture; it’s actually the most relaxed time of us.” Contrary to their dissatisfaction with shopping and restaurant choices in Chongqing, these people appear to really enjoy the un-branded hot pot establishment as much as a high end restaurant. Chongqing is maturing rapidly as an economic centre and its share of GDP is now in the top six in China. It has a large group of wealthy consumers whose demands and expectation of luxury service and shopping options have not yet been met, but these people are also open minded, experimental and love their local culture, something that luxury brands need to tap into.